Visit the global Europe » United Kingdom » England archives for posts from all DGR sites. 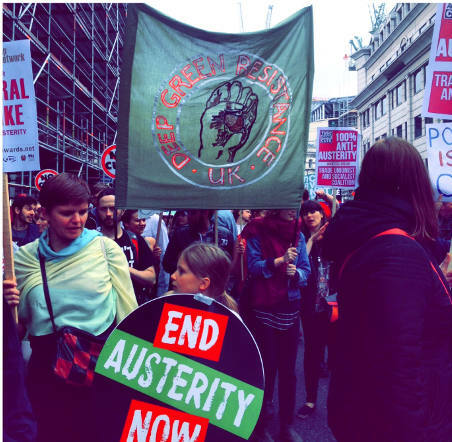 On the morning of 20th June, some members of Deep Green Resistance UK met outside the Bank of England in London to join hundreds of thousands of people on the anti-austerity march to Parliament Square. We decided to join the march to show opposition to the proposed public spending cuts that would disproportionately affect lower classes, women, and people from ethnic minorities. Government figures show the cut are only necessary because of the hundreds of billions of pounds spent to bailout bankers in 2008, and also could be avoided if international corporations were forced to pay tax. The day was peaceful and had a carnival-like atmosphere with music, dancing in the streets, elaborate costumes, and people from a range of backgrounds coming together to unite around a common belief. We held a DGR UK banner and handed out hundreds of leaflets to people who either hadn’t heard of us and were curious to know more, or had heard of us on the internet and were happy to see us on the streets. It was the inaugural unfurling of the DGR UK banner, putting us officially on the map. This is only the beginning. . . This entry was posted in Protests & Symbolic Acts and tagged DGR activity & statements, Deep Green Resistance, London on July 2, 2015 by Norris Thomlinson. DGR UK members and supporters ran a day of talks, workshops and discussion on Saturday 22 November in NE London. It was well attended and we had a number of interesting discussions. There are plans to have another DGR UK event in October this year, details to follow. There will be a Resisting Together Gathering from May 15-17 near Oxford. 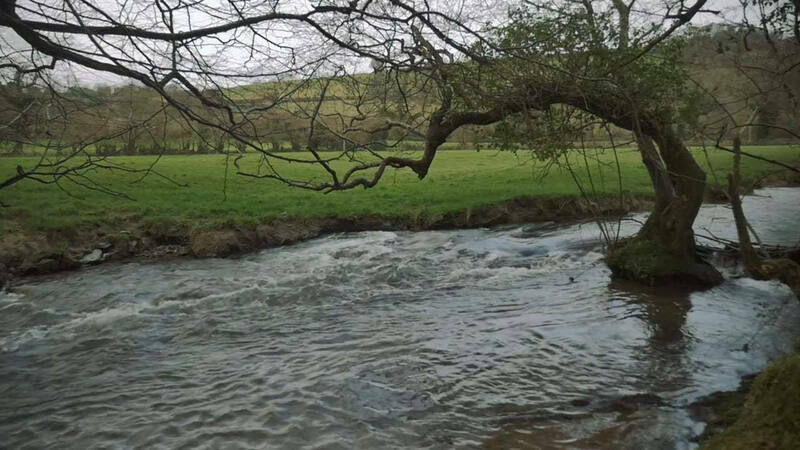 It will be at a farm camp site near the ruins of an old manor house, close to a canal and woodlands, where we can spend some slow time close to the Earth, discuss what’s happening to our world and how to resist it. 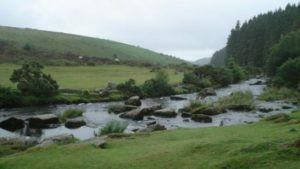 This entry was posted in Movement Building & Support and tagged DGR activity & statements, Deep Green Resistance, England on April 2, 2015 by Deep Green Resistance UK. Deep Green Resistance UK would like to invite you to a free day of talks and workshops on Sat 22 November in Willesden, NW London. This will give people the chance to hear more about and discuss our radical analysis, to learn about our strategy and to talk about the kind of tactics we think are necessary to save life on earth. For more information see the event flyer or the facebook event page. Please share with your networks. DGR is requesting support for a documentary promoting strategic, effective resistance. Please visit the fundraiser page for ‘On the Side of the Living’ to learn more and help fund or promote the project. DGR UK members have had a busy summer. Adam and Dee ran a stall and a workshop at the Green Gathering at the end July. Read Dee’s report-back. The Artist Taxi Driver interviewed Adam at the stall. Watch the video and visit the Deep Green Resistance youtube channel for many more videos. In August, DGR members helped with organising the Reclaim the Power gathering that resulted in thirteen actions against the fracking industry. Adam was part of the Earth First Summer Gathering collective and, with DGR supporter Helen Moore, ran a workshop on building a culture of resistance. We will be running this workshop again at the DGR London event on November 22nd. Adam presented on the DGR analysis/strategy at the Green Party Conference at the start of September as part of a Resisting Together event. Ben and Adam ran a DGR UK stall at the London Anarchist Bookfair on Saturday 18th October. 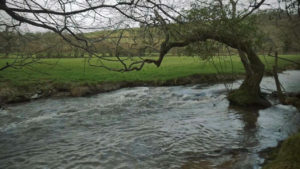 A number of us will be meeting for a Resisting Together camping gathering near Frome on October 31st to November 2nd. This entry was posted in Education, Obstruction & Occupation and tagged Adam Herriott, DGR activity & statements, DGR writing & analysis, England, Fracking, Video on October 25, 2014 by Deep Green Resistance UK. An anarchist group calling themselves the Angry Foxes Cell has claimed responsibility for the fire that has ripped through the Police Firearms Training Centre in Black Rock Quarry, being built in Somerset. In their communiqué they state they used an accelerant to burn the major electrical cables which led to the blaze. Their reasons for targeting this centre are to respond to the increasing levels of oppression and surveillance by the state. It also marks the two year anniversary of the UK riots. And it also coincides with the announced start of the cull of badgers in the South West of England, which this group is strongly against. The same group have also claimed responsibility for damaging two vehicles near St George, Bristol. One belonged to G4S, who profit from providing prison and security services. The other, belonging to Amey, was targeted because they provide prisoner transport in the UK and run courthouses in the Bristol Area. Read the BBC report for more information. This entry was posted in Property & Material Destruction and tagged England, Fire, Prison industrial complex on August 29, 2013 by Deep Green Resistance UK.